To many people, the coconut plant is an ordinary plant. They do not see anything special or interesting in the plant. But to those who have eyes to see, the coconut plant is a blessing, agift from nature.Cocos Nucifera is called coconut in English, Kwakwar in Hausa, Ivi-obio in Bini, Ake-bake or aku-oyibo in Igbo, Agbon in Yoruba, Uvien in Esan.It contains glycerioles of capprylic, capric, lauric, myristic, palmitic, stearic, oleic and linoleic acids. Every part of this plant is medicinal. The bark of the plant dried and burnt in to ashes is effective remedy for skin ailments like rashes, black spots, scabies and measles. Simply mix two-dessert spoons of the powder with half a glass of palm kernel oil. Apply to the affected part. For toothache, mix two tablespoonfuls of the ashes with one shot of dry gin. Stir well and use as a mouth wash.
Cut the root into tiny pieces. Measure out fifteen handfuls of the pieces into ten bottles of water. Add 5 handful of xylopia aethiopica, called uda in Igbo. Erunje in Yoruba, Unien in Esan. Bring to boil. Allow it to stand for 24 hoursDosage: ½ glass thrice daily. Chop an equal amount of pawpaw roots and coconut roots into pieces. Measure 10 handfuls of each into 10 liters of water. Add 5 bulbs of garlic. Bring to boil. Allow it to cool and mix with one bottle of honey.Dosage: ½ glass thrice daily. diagnosed to be suffering from cancer of the breast. It was very bad then, and was considered too late foran operation. I advised her to mix 4 litres of coconut water with 1 liter of honey and take ½ a glass twice daily. So she did. Up till today the woman is still alive and going about her normal duty, even though the cancer symptoms are still very much apparent. The coconut water has clearly been exercising a moderating effect on the cancer cells. I am very sure if an operation had been performed on the breast the poor woman would have been dead long ago.The white pulp of the immature coconut is very useful for the memory. 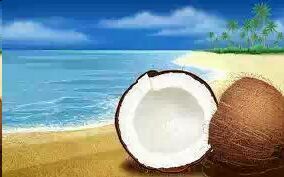 People suffering from loss of memory, forgetfulness and any form of memory defect should make friends with coconut. Remove the whitish pulp inside the immature coconut and mix with a little honey. Take as much as you wish.